Photo of fashion photography super-agent Julie Brown of M.A.P. 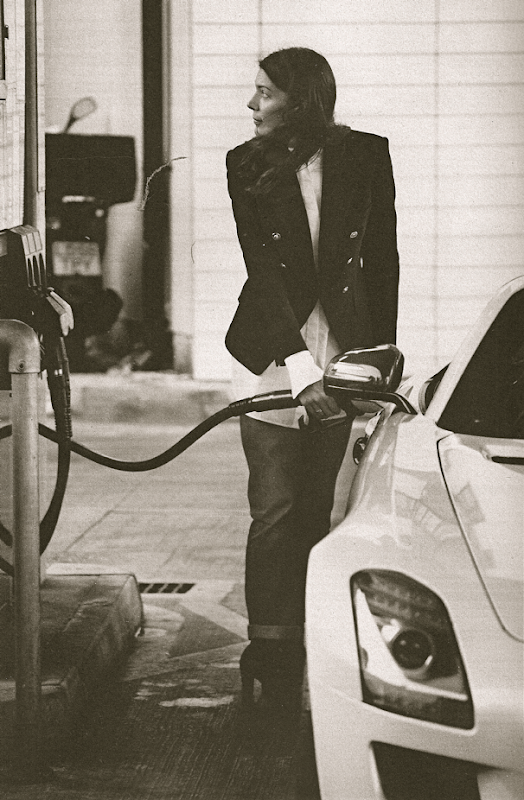 filling up a Mercedes SLS roadster in London by Daniel Riera, styled by Jonathan Kaye, scanned from issue No. 5 of The Gentlewoman. Julie is wearing her own navy Versace jacket, a white silk shirt by Céline and a pair of Levi's. the crisp whiteness of the blouse contrasting with the cool masculinity of the blazer is perfection. I love this shot. Her clothes match her mood so precisely--easy, laid back, but focused and serious at the same time. Lovely post. I love that she fems it up a bit with the addition of high-heeled booties or heels (can't tell from the pic). Cool.